‐ Audio Production / Post‐Production : For sound recording, development of multichannel sound works, documentation, mastering, mixing, film scoring, or any other task involving microphones, speakers, consoles, and computers. ‐ Creative Research: Provides artists, writers, and theorists with the opportunity to conduct research over extended periods of time (minimum six weeks). ‐ Dance / Theater: To rehearse, workshop, or finalize a production. Provides a group of up to six individuals a two‐week rehearsal period in a 3,300 sq. ft. black box space with full production support. ‐ Video Production / Post‐Production : For multiple camera shoots, documentation of a performance, development of multichannel video projection, digital video post‐production, or any project involving HD video cameras, computers, and projectors. EMPAC’s unique facilities offer four major venues including a Concert Hall, Theater, and two black box Studios, in addition to artists in residence studios and a state of the art infrastructure. To apply, please include a letter of intent, a project description, a resume or CV for all major collaborators, as well as works, samples, and other supporting materials. Proposals are reviewed by EMPAC curators four times a year. Upcoming reviews will take place on January 14, April 15, July 15, and October 15. In general, residencies are scheduled six months to one year in advance. For more information, please visit: http://www.empac.rpi.edu/residencies/artist. 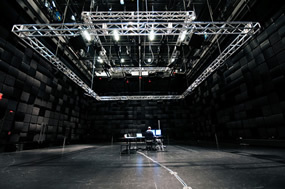 The Curtis R. Priem Experimental Media and Performing Arts Center (EMPAC), founded by Rensselaer Polytechnic Institute, is an international hub for art, performance, science, and technology — offering adventurous interdisciplinary public events, support for artists and scholars engaged in creative research, and the resources of a state-of-the art facility for digital media production, research, and performance situated on a college campus. EMPAC’s building is a showcase work of architecture that spans the physical and digital worlds. With a 1,200-seat concert hall, a 400-seat theater, two flexible black box studios, audio and video production rooms, and residency studios, EMPAC is a unique environment where digital technology and human experience can meet. EMPAC 2010-2011 presentations, residencies, and commissions are supported by grants from the National Endowment for the Arts, the National Dance Project of the New England Foundation for the Arts (with lead funding from the Doris Duke Charitable Foundation; additional funding from the Andrew W. Mellon Foundation, the Community Connections Fund of the MetLife Foundation, and the Boeing Company Charitable Trust), and the New York State Council for the Arts. Special thanks to the Jaffe Fund for Experimental Media and Performing Arts for support of artist commissions.